Because of this great scholarship, I no longer had to work 35–50 hours a week to make ends meet. Growing up in Maryland, Allen Corbin knew that if he was going to go to college, he was going to have to work to pay for it himself. When he realized just how expensive higher education was going to be, he quickly saw that Carroll Community College in Westminster, Maryland, was his best and most affordable option to start his educational career. Always gifted academically, Corbin excelled in his courses, but he still didn’t know what career he wanted to pursue. With his skill in math and science, he decided to give Engineering 101 a try and found the exciting, inspiring program he’d been looking for, with vast job opportunities to boot. After earning his associate degree in electrical engineering from Carroll with a near 4.0 GPA, Corbin set about searching for a rigorous, well-respected, and affordable undergraduate program to help him take the next step. The University of Maryland’s A. James Clark School of Engineering was a natural fit, both because of its urban location and because of the impressive name recognition it garners with potential employers. When he found out he had been awarded an A. James Clark Opportunity Scholarship for Transfer Students, that sealed the deal. 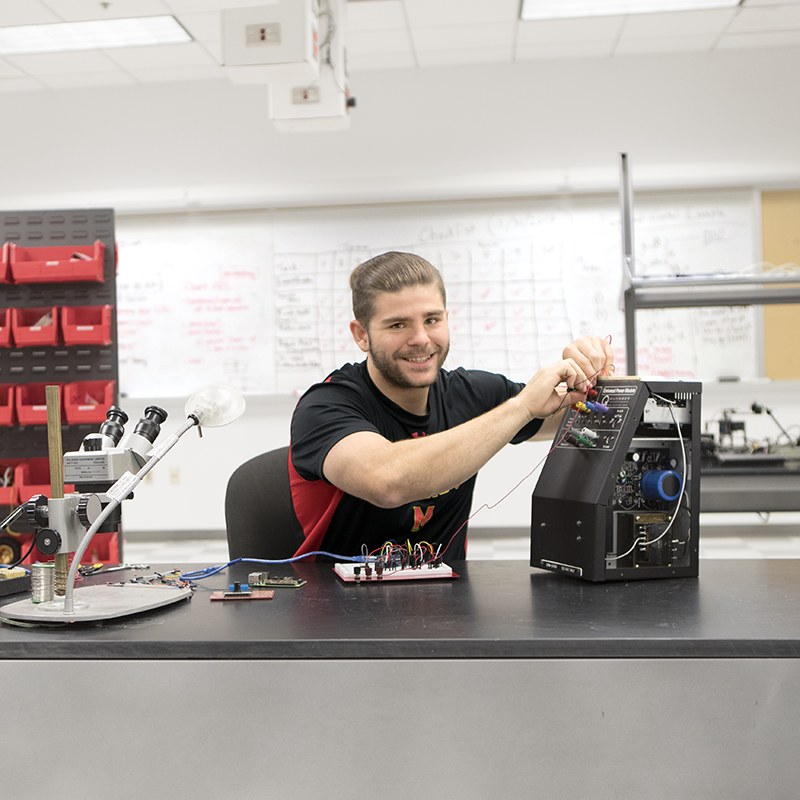 When he’s not on the field, Corbin has been fortunate to work as an electrical intern for two summers at Mona Electric Group in Clinton, Maryland. His work has included collaborating with divisions throughout the company, constructing online simulations to predict the severity of potential arc flashes, working onsite at the Cannon House Office Building in Washington, D.C., and building a bus garage at Joint Base Andrews. Corbin graduates from UMD this fall, and he is excited to have already landed a position as a systems engineer for Leidos, a global leader in the integration and application of information technology, engineering, and science and corporate partner of the Clark School.